I'm not sure what it says about Red Giant that Apple introduces the ability to stick things on our text messages, and our immediate thought is: how we can use it for lens flares and explosions? ... Our customers use our tools every day in their work, and we saw this as a great opportunity to make something cool and fun that they could use every day outside of their work. 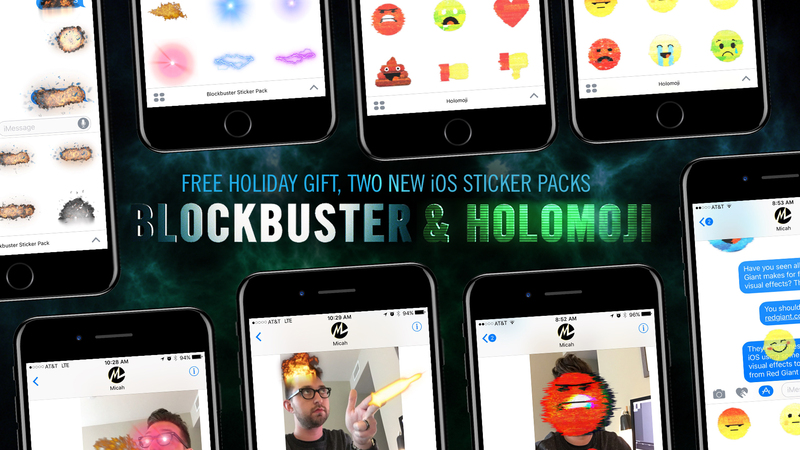 And we built all the imagery using our products " all the explosions, fire, and muzzle flashes were created entirely with Trapcode Particular; all of the lens flares were made with Knoll Light Factory; and the Holomoji Stickers were all brought to life with Red Giant Universe's Holomatrix II. Portland, Oregon - Red Giant is a software company made up of talented artists and technologists who collaborate to create unique tools for filmmakers, editors, VFX artists, and motion designers. Our company culture is focused on finding balance between work and life. We call it "the double bottom line." This philosophy helps us ignore complexity in favor of building simple tools that yield giant results. Over the last decade, our products (like Magic Bullet and Trapcode) have become the standard in film and broadcast post-production. With over 200,000 users, it's nearly impossible to watch 20 minutes of TV without seeing our software in use. From our experiences as artists and filmmakers, we aspire to not only provide tools for artists, but inspiration as well. Watch our films, learn from over 200 free tutorials, or try our software. All Material and Software (C) Copyright 2017 Red Giant. All Rights Reserved. Apple, the Apple logo, and OS X are registered trademarks of Apple Inc. in the U.S. and/or other countries. Other trademarks and registered trademarks may be the property of their respective owners.